Keeping out of the D: Was that it? The Glen Games are over once again- and your tartan tie is tucked away for yet another year in the drawer beside the bed in the spare room where you slept after your capers on Games Night. It was ever thus. More sober souls will also reflect that yet another year is on its way past and once again Glen shinty has won absolutely nothing of any consequence, despite 100 years of trying-does that have to be ever thus as well? Would that it were not so. This assessment might appear unnecessarily gloomy – wrong, even when one thinks that the Club has won North Divison 1 and 2 and 3, as well as a Strathdearn cup over the past few years, but-it has to be said -is that it? Is that all that is to be won by a side which is the possessor of the finest sign in the North? This rant is born out of frustration perhaps that here we are with two games to go in the Premier-and the Glen are barely safe while team 2 is still in dire straits. Yet the top side beat every team in the Camanachd semis this season and the seconds have won over the Garry, Kingussie and Newtonmore-but who won the Sutherland? Which two teams are contesting the Strathdearn ? A year or so back we took 5 goals off Kyles and before that put them out of the Camanachd on their own ground. Kyles squad has not changed much but clearly they have improved. They have every prospect of winning the Premier League this season and have already put both the MacAulay and the Celtic Society Cups in the trophy cabinet. Last year these same guys made it to the Camanachd final and Fort were able to squeeze past them –just. The Glen? ........ Still it’s the taking part that counts as well as the forging of community ties, the excitement of Lotto night and the fun of watching the lads run up Achmony on Games day carrying a big stick. The Wing Centre resists the temptation to say what he would do with a big stick if it came to hand. 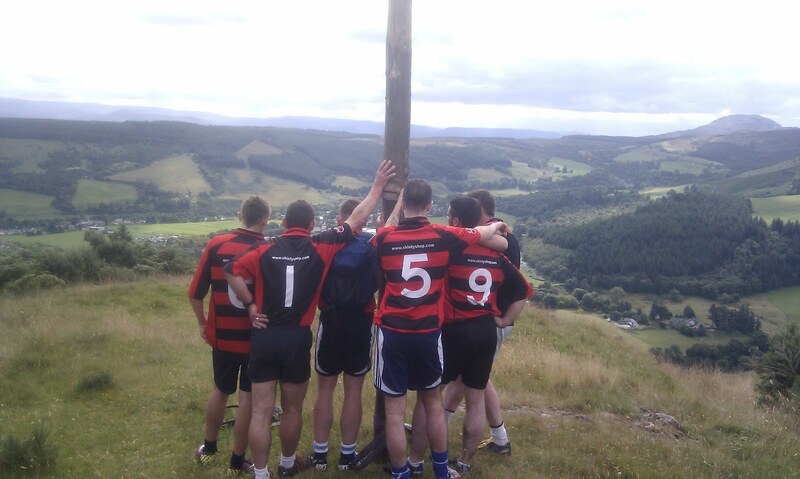 However the lads put their shoulders to the stick and ran up the hill with the caber in 41minutes and a wee bit, though Garry Mac could have probably got it up to the top in the trailer in fewer than 5. Not only that but they won the Tug o’ War – and no doubt dug up the field in the process. What are they like? Mention of Garry Mac brings to mind his performance in Zandra’s sixes where he captained a very smart outfit from “Hillside” to win the trophy beating the “Town” by the odd goal or so -on penalties no less -with John Barr scoring the winner. It all made for a good pre-Games evening with teams from Balmacaan Rd, Lewiston, Druimlon and Up the Glen also present to make the evening fly by. The geographical dimensions of “Hillside“ however were somewhat of a talking point stretching as it apparently did from Gartally to Abriachan as one can make out when one looks at the personnel gathered together for the snap. Whoever drew up these boundaries obviously never had Bob Swann for Geography. 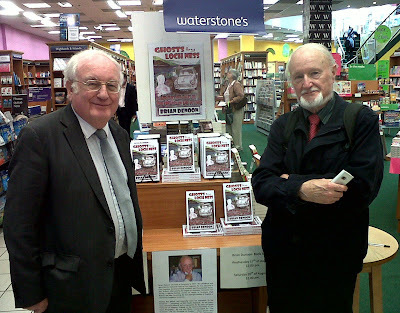 Equally contentious was the presence in the ‘Up the Glen’ side of T W Maclean Esq. who, as everyone knows has a 450 phone number which should have disqualified him (and young Rory) from participation in the squad. Who knows -their absence might have freed up a place in the squad for ‘old’ Ali Mac. People were asking why he wasn’t playing-but not many. Also at the Games the Bulletin went on sale containing a rather flat round up of the season from the Treasurer who was also at pains to point out that at the same table as Pat Veitch was flogging the Glen’s annual publication, her former judo teacher Ken Macleod was also selling the latest publication to flow from the pen of an old friend of both shinty and the “D”, Brian Denoon. 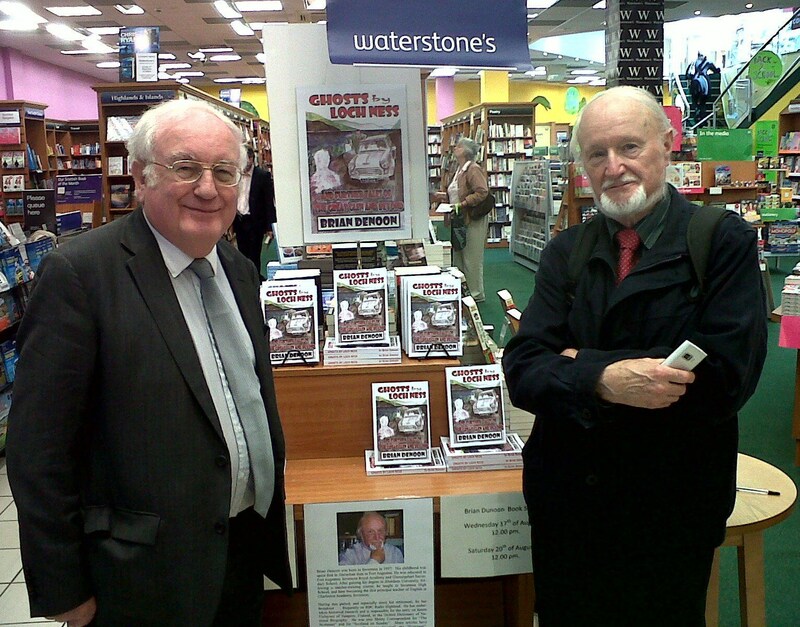 Entitled “Ghosts by Loch Ness & Further Tales of the Great Glen and Beyond” the book contains a chapter on Willie Jack the shinty hero of his youth in Fort Augustus. Brian also contributed a chapter to “Keeping the Camanachd Flag Flying” a publication which was released to mark the 150th Anniversary of Aberdeen University Shinty Club and was put together by the efforts of former Beauly lad, Steven Mackenzie. Other Glen lads who contributed chapters to that excellent publication included Burton Morrison, Jamie Bell and Malky Munro though it’s hard to believe that they would allow themselves to be directed by a guy from Beauly. However that’s the modern world! Gone are the days when the serfs from over the hill, beholden as they were to the great estates on which they were tenants, were required to surrender dirks and camans as they entered the green Glen where a freemen could take deer from the hill, salmon from the loch and sticks from the wood and sell them in the town without bowing the knee to the Laird's representative. Changed days indeed! The book though- and Brian’s – is worth a modest investment- at least that is what the Editor of the Bulletin contrived to say in the letter he sent to the D in which he enclosed a copy of his article on the Club’s year. It is hard to disagree with such sound judgement. Last season was a period of modest progress for Glen Urquhart Shinty Club in that both of our sides tasted some degree of League success. 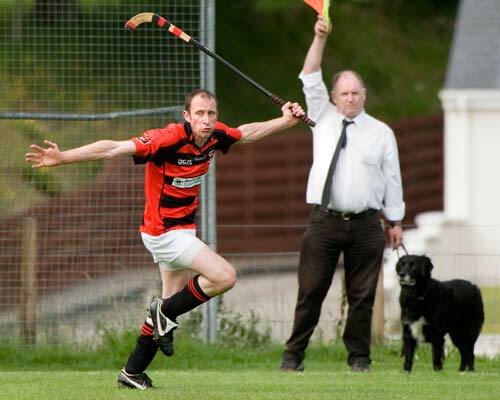 Our first team maintained our position in Shinty’s Premier League though truthfully there were some hairy moments, while our second team won the Marine Harvest Division 2 Championship with a fine win on the final day at Invergarry. The second team under Stephen Henderson and Mike Cameron also made it through to two Cup Finals, the Sutherland Cup and the Strathdearn Cup but as luck would have it we lost out in the first of these to local rivals Lovat at Newtonmore by 4-1 but reversed the result in the Strathdearn with a fine win 2-1 again over Lovat, to bring that particular cup back to the Glen for the first time since 2002. At present both sides are holding their own in their Divisions but as I write neither is clearly safe from the relegation zone. The big disappointment for the first team is their lack of progress at Cup Level, the exit from the Camanachd Cup at Kinlochshiel being especially upsetting especially when one considers that the side, though admittedly inconsistent, has recorded good away wins over both of the Badenoch big two, Kingussie and Newtonmore. On the playing side our season eventually got underway with the Zandra Mackintosh Memorial Six a Side Tournament at the end of January and this year the honours went to Druimlon while the trophy for player of the tournament was picked up by David Emery. Jim Barr agreed to continue with the management of the 1st team and was joined by Drew MacNeill, former Fort William supremo and present Scotland International boss and it has to be said that his influence especially in the “big” games has been very important. With Mike Cameron stepping down, Steven Henderson remained in charge of the 2nd team and he was later joined by former Scotland manager Fraser Mackenzie (the official one) who has proved to be an invaluable sidekick. This year the team has not been quite so successful in the League but did manage to make it through to the semi-final of the Sir William Sutherland Cup but sadly missed out on another big final day losing out 4-1 to Kyles Athletic. The side also reached the semi-final stage of the Strathdearn Cup but lost out to our neighbours Glengarry. We wish them all the best. Recognition of our success came in the Marine Harvest awards where Mike Cameron and Steven Henderson were awarded with the North Division 2 Coach of the Year Trophy while Ewan Brady picked up the Under 14 Player of the Year trophy. Particularly gratifying was the fact that Helen Maclennan was awarded the Donella Crawford Trophy for Youth and School Volunteer of the Year. Well done to all. Further recognition of the standard at which the top side has been playing came through the selection of John Barr, Andrew Corrigan and Stuart Mackintosh for the International side which played the double header against Ireland in October and November winning ironically at Croke Park, Dublin but being narrowly defeated at home in Inverness. Thanks as always are due to Chairman Russell Fraser and the rest of the various committees including those hardy souls who have managed to keep the grass down to an appropriate level for games and have the patience to erect the sponsors’ signs. These include Dave Emery, Billy Reid, Peter Macdonald, Geordie Stewart and Ken Fraser. This year thanks are also due to Helen Maclennan, Davie Stewart, Stuart Mackintosh, Stuart Morrison and Ally Mackintosh (Jun) who have continued to move our youth development at under 14 and under 17 level forward. The Under 17s did well in particular and won the Inverness Six a side trophy on Monday 27th June. The Glen was undefeated in this round robin event, meaning they topped the table and played Caberfeidh (runners up) in the final winning 3 – 0. At Primary level Jan and Alan Bell, Helen Maclennan, Laura Stoddart and Jimmac Mackintosh have also striven hard to keep the youngsters engaged in the indigenous sport. To do so they have continued to organise the Primary Glenalbyn League by providing regular shinty days for the youngsters to enjoy and this also bodes well for the future. A successful shinty skills and competition day was held on Saturday June 25th 2011 and thanks are once again due to Helen Maclennan, Jimmac Mackintosh, Renee Macdonald, Peter Macdonald and all those who helped make it a great day for Primary Shinty in the Glen. The National under 17 squad for Ireland, in July, contained Glen lads Fraser Heath and Ewan Brady and these two lads plus Euan Lloyd, Rory Maclean, Cameron Maclennan and James Hurwood attended the National Shinty summer development camp at Strathallan School in July. Congratulations also go to the High School pupils and staff for the organisation of the Schools under 16 and under 14 Robertson Cup 6-a-side Tournaments which are such a highlight of the competitive season for secondary age players. It is hoped that the young players whom these competitions produce will prove themselves excellent material for the Club’s future. In order to meet the cost of travel and equipment for these senior teams as well as the under-14s and under-17s, the Club runs a weekly Lotto. This is our main means of support and we are most grateful to those who regularly purchase our tickets as well as those local businesses that help to sell them. A special word of thanks here is due to Billy Reid for organising the draw and once again to our chieftain Alan Bell who would appear to find buyers for the bulk of the tickets actually sold. Under the Chairmanship of Garry Mackintosh and with the particular help of Isla Urquhart, the fundraising committee has done sterling work this session. Isla was instrumental in running a successful Gala Day at the Loch Ness Inn while Garry Mackintosh in particular has been especially instrumental in keeping up the profile of the club to sponsors in what are very difficult financial times. The boards that advertise these sponsors are on display at matches. As always, the annual Sale of Work continues to be successful and last October raised over £2000. Finally thanks are due to Managers Jim Barr and Drew MacNeill for the hours they devote to the top team while Steven Henderson and Fraser Mackenzie (the official one) deserve special mention for the time spent in managing the seconds. We are also grateful to our trainers Graham Whyte and Alan Corrigan. Thanks yet again go to Helen Maclennan for looking after the strips as well as to her Mum Janet Emery for keeping the pavilion spick and span. Not to be forgotten are all those who help on the tea rota. They are too numerous to mention individually. Finally, a word of appreciation is certainly due to Alan Bell (Chieftain) Russell Fraser (Chairman) , Hazel Stewart (Secretary) , Fraser Mackenzie (the original one) (Treasurer) , Stuart Mackintosh (Fixtures Secretary), Billy Reid (Lottery) Ron Fraser, Billy Macleod, Garry Mackintosh, and Davie Menzies for the efforts on behalf of the Club and their willingness to serve on the Committee. On a more sombre note the Club was saddened to learn of the death of Eddie “Gavie” McGavin at the end of last year. “Gavie” was one of the finest forwards Glen shinty had produced. In his day there was no finer goal scorer in the North - and he was a mainstay of the great Glen team of the late 1950s and early 60s. “Gavie” emigrated to the United States to work in the aerospace industry and, though he returned to the Glen from time to time for holidays, he was to remain in the U.S. for the rest of his life. He was cremated in the US and on 6th November 2010 his ashes were scattered on the pitch at Blairbeg after a well-attended memorial service held at the Pavilion and conducted by the Rev Hugh Watt. Very recently the Club was also deeply saddened to learn of the untimely death of Pauline Bell, wife of former player Jamie Bell, daughter in law of Alan and Jan Bell. Our thoughts are with Jamie and his young family as they come to terms with a future without Pauline. Glen steals one ‘More win.